It’s been a while since Miley Cyrus has gone under the needle for a tattoo tribute to Liam Hemsworth, but now that the couple is back together (and may even be planning their wedding, depending on which reports you believe), it appears the pop star may have added a new tattoo to her collection in honor of her Australian beau. Tattoo number 46 for the inked-up singer is a tiny replica of a jar of Vegemite yeast paste inked on the back of her upper left arm, in between her avocado and “KATZ” tattoos. It was the infamous Dr. 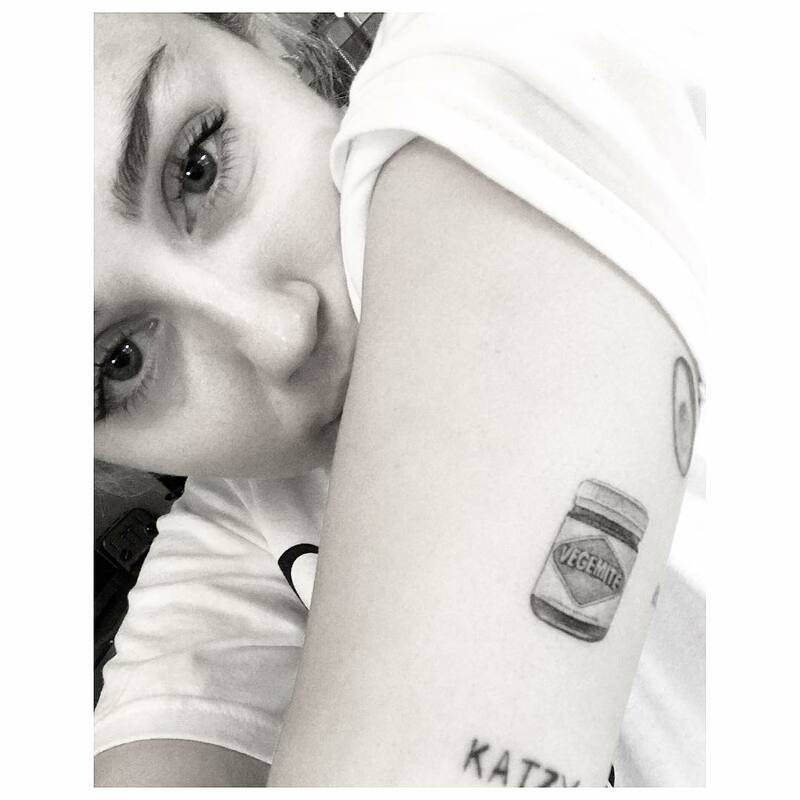 Woo of Shamrock Social Club who posted a photo of Miley Cyrus’ tattoo on Instagram on June 10, captioning the black and white pic, “@mileycyrus don’t play when it comes to #vegemite.” A jar of Vegemite may seem like an odd choice for a tattoo, but the yeast paste is a popular snack in Australia, and the fact that Liam Hemsworth is Australian has many speculating that the actor may have been the inspiration behind the ink. 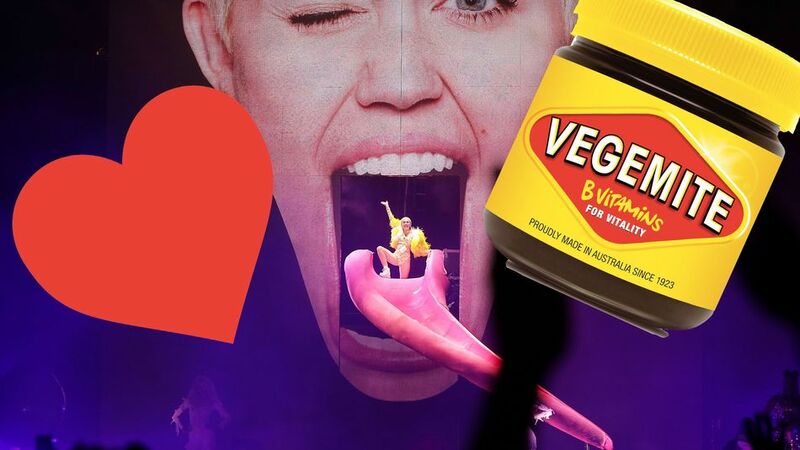 Considering the fact that Miley and Liam were together for several years before ending their engagement in 2013, it’s possible that the 23-year-old pop star may have developed a love for Vegemite herself, but Liam has said in interviews that he lived on the yeast paste when he was younger. This isn’t the first time Miley Cyrus has gotten a tattoo tribute to Liam Hemsworth. Back before they ever got engaged, Miley and Liam both went under the needle for matching sugar skull tattoos on their ankles, and in early 2012, the pop star got a “love never dies” tattoo on her bicep that was presumably a shout-out to Liam as well. A few months later, in July 2012, Miley and Liam took it one step further and got matching tattoos inspired by U.S. president Teddy Roosevelt’s 1910 “Citizen and Republic” speech, which obviously held an important meaning for the couple. While Miley Cyrus opted to have the line from the speech that reads “So that his place shall never be with those cold and timid souls who neither know victory nor defeat” inked on her left forearm, Liam had the phrase “If he fails, at least [he] fails while daring greatly” inked on his left bicep. Although Liam Hemsworth’s tattoo was actually inked with an error – it’s missing the second “he” – it’s obvious that the tattoos were meant to correspond with one another. We have a feeling there are many more tattoos in Miley Cyrus’s future, and if she really does become Mrs. Hemsworth, we’re sure there will be plenty more inspired by Liam, too!